The Never Ending Toilet Roll. Yes buying toilet paper will be a thing of the past! Now all you need is one toilet roll. As you reach the last sheet of paper just drop the roll in a bowl of lukewarm water and hey presto! A full roll of toilet paper. 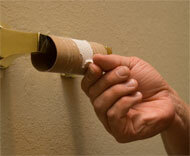 Yes with the Never Ending Toilet Roll you will never feel that dreaded panic again. Guaranteed labrador puppy repellant too.